The Army Combat Badge is awarded to any member of the Australian Regular Army (ARA) or Army Reserve (all elements) on Continuous Full-time Service or other Reserve member in exceptional circumstances, for service in warlike operations or situations. This award does not replace the Infantry Combat Badge. 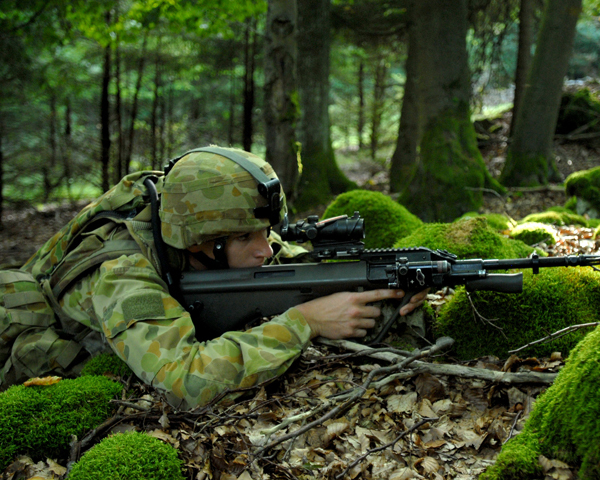 The purpose of the ACB is to recognise any member of the Australian Defence Force who was force assigned to an infantry, armour, artillery, aviation or combat engineer based combat team/battle group, or similar unit/sub-unit, and who has served for a specified period of time on warlike operations. In exceptional circumstances, service on operations whilst serving in other than warlike activities, such as peacekeeping operations, or for units outside those designated above, may be recognised with the award of the ACB. Click here to read DI(A) PERS 119–1 (Complete Revision) which includes an application form. One could reasonably argue that all members who served in the 1st Australian Task Force in Nui Dat would be eligable to receive this award, especially those who served in the 8th Field Ambulance who often flew DUSTOFF. A member of the 8th Field Ambulance, LCPL John Gillespie was tragically killed in action when attempting to evacuate wounded during a DUSTOFF Mission in the Long Hai Mountains and would not have been eligable to wear the ACB.